Starting with chicken is simplest, as the bones in chicken are soft and edible. Buy whole chickens (make sure they have no more than 100mg of sodium per 4oz [or 120g] serving) or chicken quarters. The general guideline is 2-3% of ideal ADULT bodyweight per day. You can always adjust the amount as needed, feeding a bit less than necessary can be easier on newbie tummies. When feeding a puppy, meals should portioned out for several feedings per day. So an 8 week old puppy’s total feeding amount should be split into four meals a day. As they get older, you can decrease the frequency of meals. After approximately 4 months, you can feed three meals. After 6 months , you can feed two meals a day. After they’re a year, you can feed one meal per day. Another approach is to feed the puppy the entire day’s amount and allow him to eat his fill four times a day. With this method you’re keeping track of his daily amount but letting him decide how much he eats in each meal which can teach a dog to ration themselves. Keep an eye on his weight, and adjust the daily amount as needed to keep him lean. Because chicken bones are soft your dog should be able to eat the bones with ease, razor sharp puppy teeth should have no problem. However, you can give him a head start the first few days by cutting ribbons into the flesh and scoring the skin with a sharp knife. After a short adjustment period you can add other meats. I like pork as a secondary meat. Pork is an inexpensive easily purchased red meat with relatively soft bones. Even the tiniest toy breed can at least nibble the ends off pork bones. For medium to large dogs the bones are completely edible. 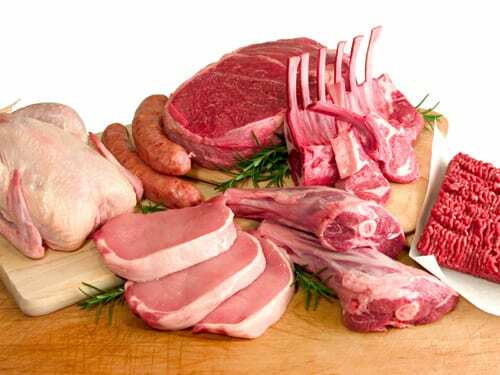 Additional meats to look for are beef, goat, venison, lamb, veal, rabbit, turkey, duck, kangaroo, or emu. Variety is beneficial, as long as the meat isn’t enhanced with a saline or broth solution. Again, your upper limit will be 100mg of sodium per 4oz (or 120g) serving. Your ultimate goal is to feed primarily meat (as much red meat as possible), a bit of edible bone, and eventually some organ. In numbers, that’s about 80% meat (flesh, fat, skin, sinew, etc), 10% edible bone, and 10% organ, half of which is liver. Tongue and heart are fed as meat, not organ. Organs include liver, kidney, spleen, glands (sweetbreads), pancreas, eyes, and brains. Edible bones firm up stool, organs and meat (to a lesser degree) loosen it. Whole chickens have a fairly high bone conent which can be beneficial in the beginning. Newly raw fed dogs may have loose stools in reaction to the switch, the higher bone content can help bind up the stool. Eventually (meaning weeks or months down the road), you want to lower the amount of bone you feed. This is easy to accomplish once you start adding red meat. Bones you should avoid feeding are naked bones (meaning those that aren’t covered with meat). Also the weight-bearing bones of large animals such as beef, elk, moose, bison, or elephant. Basically, don’t feed bones that have to hold up a huge animal. Sooner or later, these bones will damage the teeth of your dog. Some words to look out for–and avoid–are soupbones, marrow bones, femur bones, knuckle bones, dog bones. Don’t waste your money, and don’t risk your dog’s teeth. Once you’re comfortable feeding chicken, and perhaps one other type of meat, you may add organs. START SLOWLY. Liver is non-negotiable but must be only a small part of the diet, somewhere around 5%. Liver provides nutrients that are not available in other parts of a prey animal, so it’s a crucial 5%. Start small, with just a bite of liver. Some dogs adore liver and take to it immediately, while others are put off by the texture/taste. If you have a hesitant liver eater, try offering it frozen or half-frozen, searing it for a second or two in a screaming hot pan, dropping it “accidentally” on the floor, or giving it as a treat for a difficult trick. Another option is to offer the liver of various animals. Chicken liver, pork liver, and beef liver all taste differently (even a calf’s liver tastes different from beef liver), your dog may have a preference. As for other organs, feed a small amount of whatever organs you can find. Variety is good, but don’t spend an inordinate amount of energy searching. Once your dog is eating organs, use the knowledge of your dog’s reaction to decide how frequently to feed them. Some dogs can eventually eat organ-only meals, some can never without having very loose stools. Some people prefer to offer a small amount of organ very often, while others give a few organ meals per month. There’s no right way to do it, as long as it works for you and your dog, and basically achieves the 5% liver, 5% other organ goal. The beauty of raw is the flexibility, making it work for your dog and your family. No vegetables, no grains, the diet should be nothing but meat, bones, and organs. For a healthy dog, the only supplement you might consider is a good quality fish oil. Especially if you feed primarily supermarket meat, which tends to be grain fed. This means that the Omega 3:Omega 6 ratios are disproportionate. A good fish oil (not cod liver oil) will balance the ratios. For fish oil, a maintenance dose is 100mg DHA+EPA per 10lb of dog. A 100 pound dog would get 1000mg. DHA+EPA total, daily. A typical gelcap contains 300mg DHA+EPA. Don’t go by the number on the front of the bottle, make sure you’re reading per gelcap, not per serving.